Andrew ‘Birchy’ Birch is an East London born, right-arm medium-fast bowler for the Warriors Cricket. He brings enthusiasm and energy to the team and loves spending time with his family, eating lots of sushi, playing golf and horse riding. Birchy went to St Andrew’s College in Grahamstown and later studied at Nelson Mandela Metropolitan University. 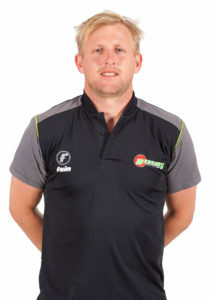 In 2004 Birch represented South Africa at the Under-19 Cricket World Cup and has played for the South African ‘A’ side. He made his first-class debut for Eastern Province in January 2005. As an integral part of the Warriors bowling attack, Birch has over 300 first-class wickets, with a personal best of 5 for 16, against the Titans on the 2nd of December of 2016. If Birchy was not playing cricket he would be farming with the rest of his family, which is where he started playing cricket with his older brother.